With only a year to go until the UK’s first clean air zones go live, Natalie Middleton looks at how different cities are tackling urban air pollution. Although the UK’s air quality problems are nothing new, it’s taken until recently for the topic to reach the top of the political agenda. Yet, three years forward from the Government mandating clean air zones in five cities, research shows four out of ten SMEs are unaware of their imminent launch, and there’s no sign that the rules will be aligned between them. 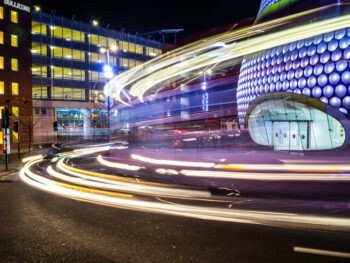 Government plans have changed; Birmingham, Derby, Leeds, Nottingham and Southampton were originally ordered to bring in such zones, which charge the most polluting vehicles to enter areas with poor air quality, in the 2015 Air Quality Plan. The UK is one of six EU Member States which have been referred to the European Court of Justice for failing to take action to tackle illegal levels of nitrogen dioxide. Despite continued legal action from environmental lawyers, ClientEarth, the Government backtracked on making these zones mandatory in last year’s updated plans. This placed a focus on local authorities to make their own decisions, and called for 23 additional areas to take measures to curb their illegal NOx levels. Earlier this year, that was extended to 33 local authorities, with a deadline for plans set by the end of September 2018. All of which means clean air zones in one form or another could be on their way to a city near you soon. How do clean air zones work? According to the Government’s framework, there are two types: charging and non-charging. Non-charging zones put the focus on a range of measures to improve air quality – such as access restrictions which are already used in places such as Oxford for buses and incentivizing ULEV take-up – but don’t charge non-compliant vehicles for entering the zone. Charging clean air zones also use a range of measures, but also include financial penalties for more polluting vehicles to enter. Although the latest air quality plans means the five cities are not required to include a charging zone in their plans, the measure is believed to be the quickest way to achieve statutory NO2 limit values in towns and cities in the shortest possible time. However, the Government has said that if a local authority can identify measures other than charging zones that are at least as effective at reducing NO2, those measures should be preferred – a move that’s been seen as backtracking. What types of vehicles are being targeted? To avoid charges or restrictions, cars, vans and taxis must be Euro 6-compliant (diesel) or Euro 4 (petrol). Effectively, this means most diesels registered since September 2015 (and all since September 2016) and all petrols since January 2006 (a year later for vans). Fully electric or hydrogen fuel cell vehicles will not face charges while the document also says ultra low emission vehicles with significant zero emission range will never be charged for entering or moving through a clean air zone. The good news is, according to the latest BVRLA quarterly leasing data, 87% of car fleets are already Euro 6 compliant. However, businesses also need to factor in grey fleet drivers who are very likely to be driving older vehicles – 8.2 years, according to the BVRLA. The picture for vans – typically run for longer cycles – is bleaker; Freight Transport Association estimates suggest only 22% of the vans on the road in 2019 would be able to access CAZs; a key factor in the BVRLA’s call for a carefully managed transition to enable individuals and businesses to change to greener vehicles that will not be penalised. What approaches are councils taking? Birmingham’s preference is a Class D scheme, introducing charges for all non-compliant vehicles by 2020. Leeds is opting for a Class B scheme, which would exclude cars and vans (apart from private hire vehicles). It has also revised the charging zone to lessen the impact on businesses, and proposed a ‘sunset’ period for private hire vehicles. Southampton’s preferred option is a Class B scheme, but it is looking a Class A for the city centre and non-charging measures for buses and taxis. Its 12-week consultation finished on 13 September, but it didn’t get back to us with final details. Nottingham has existing measures in place which will bring it in line with legal NOx limits by 2020. It has no plans to introduce a charging clean air zone, but it is seeking further funding for a ULEV transition support package for taxi drivers. Plans are also underway to revise the Clear Zone, which restricts access to the city centre. Derby’s consultation finished on 24 September, and final plans have not been published. Its preferred option is re-routing traffic away from its area of exceedance, supported by incentives to get people to change vehicles, and initiatives to implement charging infrastructure and sustainable travel. But it is also considering a Class D scheme, either to the inner ring road or outer ring road. Councils can bid for funding to implement such schemes through a central £255m Implementation Fund while the Government has also created a £220m Clean Air Fund to enable councils to implement additional measures that minimise the adverse effects of local air quality plans on individuals and businesses, such as installing EV charge points. Although the piecemeal approach taken to clean air zones mean the actions required by fleets are varied, it’s important to put plans in place now. This includes investigating your current vehicles, and keeping up to date with the latest initiatives where they operate. And make drivers are aware of such zones, which have the potential to cause widespread confusion. ACFO and the BVRLA have called for a common framework for signage, charging and restrictions to help avoid non-compliance. Overall, it’s worth using this as an opportunity to explore the options for low and zero-emission vehicles on your fleet, including checking out home and workplace charging. Clean air zones are by far not the only incentive for choosing greener cars. As well as avoiding a wealth of pain from clean air zones, getting ahead of the game on going green could help save your company finances – and the earth – too.